What makes Costa Rica rather unique is its geographic and geologic state. It forms a rather narrow stretch of land between the Caribbean and Pacific oceans, with its middle composed of several, and in one case, active volcanoes. 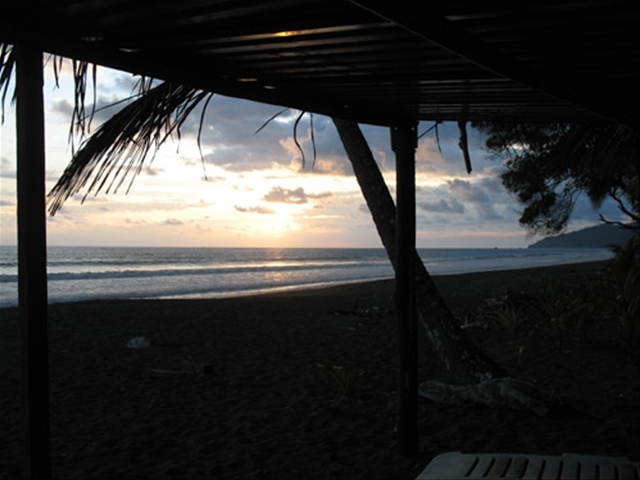 Combined with the right latitude, Costa Rica creates a climate conducive for wildlife and waves. The first week in Costa Rica I stayed with some friends in a beautiful vacation rental perched above the town of Tamarindo called, Casa Leo Loco. The place is palatial and perfect for four couples looking for a vacation getaway. It offers expansive views and solitude, but with close proximity to restaurants, shopping, and beaches. It comes equipped with a caretaker, and the infinity pool, landscaping, and attention to ambiance and architecture make Casa Leo Loco a relaxing place to stay. I am torn about how to describe the town of Tamarindo. My first impression was fairly negative, thinking that it was a rather seedy little semi-city that is in some sort of slow flux. There is much construction going on, and politicians are padding their pockets with foreign real estate money. The road into town is still dirt, and depending on the mood of any particular driver who decides to stop in the middle of it, can become clogged with traffic. While you are waiting, you see all sorts of people from American college drop outs to Costa Rican artisans trying to earn a buck. If you are walking, it is quite difficult to get through town without being asked if you would like some marijuana or cocaine. At first arrival, it is easy to think that the main drag is all that Tamarindo has to offer, but if you take your last left you will find there is much more to it, including a brand new supermercado, restaurants, bars, and casinos, and Playa Grande. The primary beach is okay with some good surf spots, but it is often crowded with tourists who are just learning how to surf. The best beaches are those that require a little driving – Playa Avellanas, Playa Negra, and Playa Conchal. I had some great surf days at Avellenas and Negra, and snorkeled and rode a horse on the beach at Conchal. If you are a surfer, and the conditions are good, you must organize a boat tour to Witch’s Rock and Ollie’s Point. Of note, Ollie’s Point is named after Oliver North who, under the Reagan Administration, smuggled arms to the Contras from this location. After a week, I did find that there were some really good restaurants in Tamarindo, and many of the people were quite nice, but I was admittedly ready to get out of there and see what the rest of the country had to offer. Unless you want to take the ferry, in order to get south of Tamarindo you need to drive east to Liberia and then make your way down Highway 1. 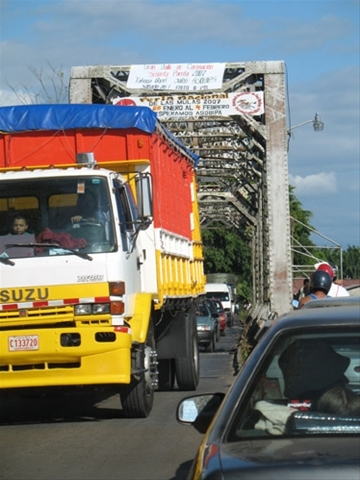 Prior to arriving in Costa Rica, I had heard horror stories about the road conditions. While I did experience my fair share of bonzai drivers, pie-in-the-sky potholes, and even a fallen tree that required some offroading to get around, it was much better that I anticipated. Still, don’t expect to get anywhere quickly. Many times you cannot go over 60 km/hr, and there are countless trucks, cyclists, and pedestrians to slow things down. Additionally, there are police checks in places, and in once instance I was pulled for speeding when I really wasn’t. The policeman recorded someone else’s speed on his radar gun in hopes that he would come upon some naive tourists in an easily identifiable rental car. Find them he did. He tried to convince me and my wife that we would have to go to the nearest town in two days to pay our ticket. We didn’t know any better and reacted foolishly. In reality, you can actually pay legitimate speeding tickets at the rental car company or the bank. We should have had him right us the ticket. Instead, we gave him $50 to let us off, and we went on our way. Once you arrive in Puntarenas, the road follows the coastline, and you are presented with many beautiful views and interesting sights to see. Jaco is a popular stop off, as is Quepos, but there are many smaller little towns and lodges along the way if you are looking for privacy. Quepos’s one redeeming characteristic is that it is in close proximity to Manuel Antonio National Park. Still, it is not a place that I personally would want to spend any time. The Park is packed and the town is grimy and uninteresting. I am so glad that I didn’t stay there. According to the Lonely Planet, the road from Quepos to Dominical is not paved because the Quepoan regional government does not want tourists to go south and spend their money there. In reality, it does not make one damn bit of difference because if a tourist such as me has a plan to go there, then we are going regardless of whether the road is paved or not. Unfortunately for the locals, they have to put up with dust and poor road conditions as they go about their daily business. While driving, you will pass many African palm plantations, for palm oil is big business in this area. Also, you very well will find yourself waiting in line at one-lane bridge crossings. Dominical is a sleepy little surf town that has been found by trustafarians, hippies, and internationals looking to start a business. Still, it has a very good and consistent surf break, nice vibe, and it is close to the tallest mountain in Costa Rica, Mount Chirripo. Tortilla Flats is one of the local hangouts, and if you are looking for an American atmosphere with good food and drinks then you’ll like the place. The road progressively gets more lonely as you head south to Puerto Jimenez. There are beautiful views of the mountains in the east, and in the west you see the curving mass of land that forms the Osa Penninsula and Drake’s Bay. I would recommend pushing on through Puerto Jimenez if you can, for there are several beautiful resorts and lodges on the road from Puerto Jimenez and Carate. However, you should know that the road to Carate is quite primitive. 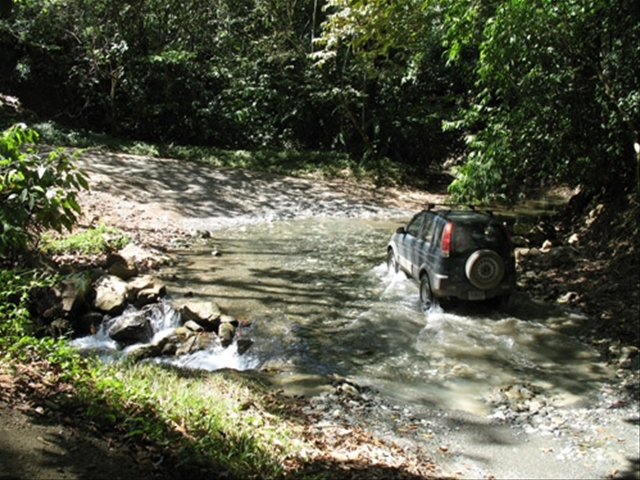 Be prepared to make several stream crossings where the water can be up to the car doors even in the dry season. At the very end of the road is Carate, which is not really a town but more of a smattering of Tico dwellings, lodges, and a landing strip for small planes. 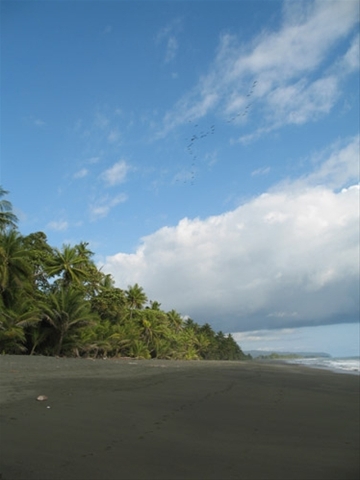 Its’ greatest significance for tourists and scientists is that it represents one of the few entrances to the Corcovado National Park. Like something out of Swiss Family Robinson and Jurassic Park put together, the Lookout Inn stands clinging to the side of a substantial peak that has been uplifted by tectonic force out of the ocean floor. Terry and Katya run the place, and they have taken great care in creating a special retreat along the Osa Penninsula. There are countless steps and meandering boardwalks that are carefully integrated into the natural environment. 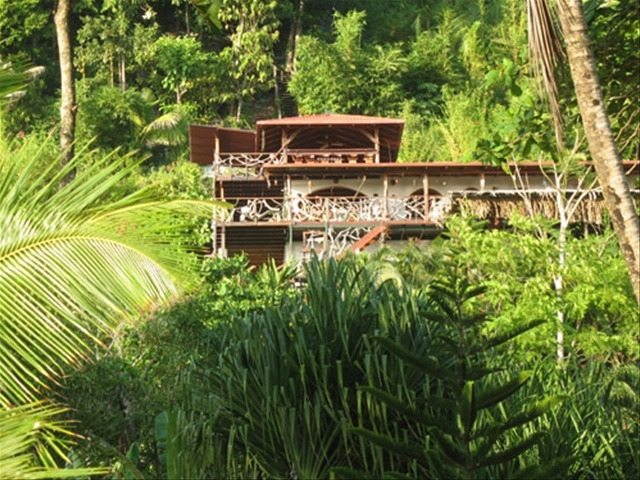 Views of the ocean and tropical rainforest are ubiquitous, and to experience either aspect is but a few steps away. The Tiki Huts are comfortably rustic, and they come equipped with excellent views and regular visits from several species of hummingbirds. 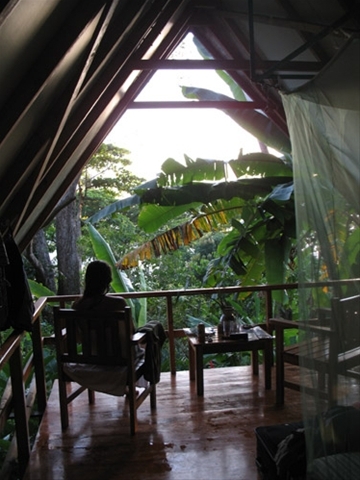 You will awake to a cacophony of birds each morning with scarlet macaws being the loudest. The waterfall hike is very nice, and you will be sure to see toucans, monkeys, and countless reptiles and insects. You begin by climbing Stairway to Heaven, which is a steep climb up some precipitously placed steps that rise directly up from the back of the Lookout Inn. There are guides that can take you into Corcovado if you really want to see wildlife, just make sure to schedule it with Terry beforehand. If you are interested in deep sea fishing, realize that you can only catch a boat in Puerto Jimenez, which is a 2 hour drive on a dirt road or an expensive plane ride. It is impossible for boats to pick you up in Carate. I had a wonderful day of surfing in front of the Lookout Inn. The waves were not perfect, but they were glassy and overhead. It felt very special to be out there in the ocean looking back at miles of pristine coastline, catching waves without another soul in sight. I won’t forget it. After stocking the cooler and filling up with gas, it was time to head back north. Stopped off in Jaco for a night and stayed at the AparHotel Vista Pacifico. Perched above Jaco on the crest of a hill, the Hotel offers nice views, a refreshing pool, and the owners are nice and helpful with directions and recommendations for restaurants and day trips. Jaco itself is quite touristy, over-developed an unappealing, but it does have a wealth of places to stay if you are breezing through. 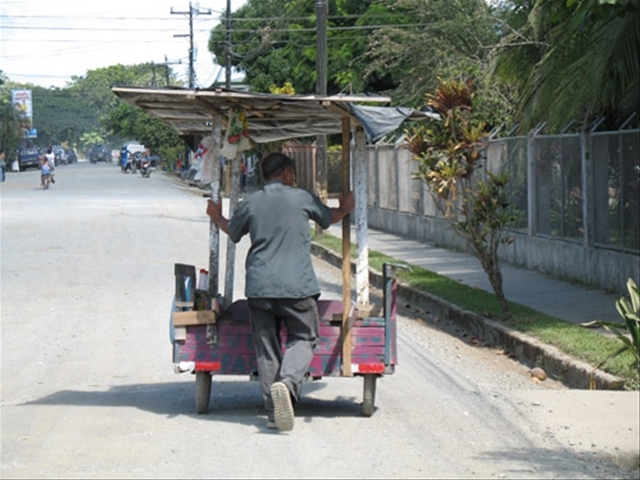 From Jaco it is a steady climb up into the mountains through a myriad of small towns that spread out from San Jose. Eventually you break free of condensed civilization, and you behold the flanks of the Arenal Volcano. Lush vegetation, running rivers, and hotsprings are fed by Arenal, and there are several places to choose from when it comes to accommodations. Tabacon Hot Springs Resort is a rather luxurious retreat with nice rooms, good restaurants, and a large complex of hotsprings that are fantastic despite the crowds. 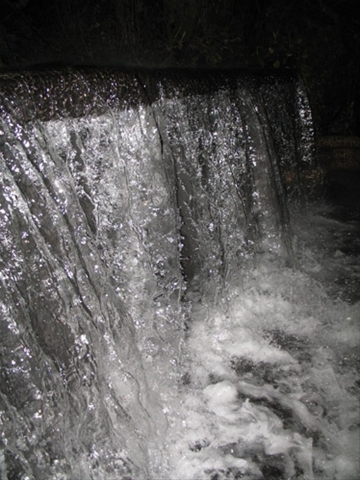 The flowing rivers and waterfalls are all piping hot and offer many different places to soak and relax. If you get thirsty there are bars to belly up to, and if you want a massage there is a complete spa center. Don’t worry, you’ll sleep very well each night you are there. There is still much to see in Costa Rica, and it will take another trip to do it. With so many other countries and regions to explore, it will be some time before I return. In the interim, I suspect that Costa Rica will continue to be subdivided into vacation homes, hotel projects, and international retreats for holier than thou environmental hypocrites who think they deserve to carve out their piece. The reserves and national parks will hopefully remain protected, with the increasing encroachment only making them more special and over-loved. Inevitably, Costa Rica’s habitats will require more governance and more laws with tourism and tax dollars footing the bill. I hope it’s enough. Were you guys worried if you didn’t pay the ticket on Monday the US would extradite you back to Costa Rica? You should have said, yeah no problem, we’ll see you bright and early monday…not! You can actually pay a speeding ticket through the rental car company. 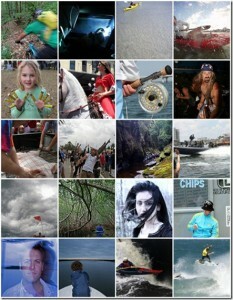 This site is very useful to the people who are interested in traveling. Oh man, I just got done wiping the slobber off my face. What a gorgeous place! Looks like you two had fun. Missing you lots. P.S. What is it with you two and shady international policemen? Hey – loved the photos and video but the music on the video was baaaad – you need some fun Latin music with that video!! I’m all ears. What kind of bumping Argentine Latin action do you recommend? Just got back from Costa Rica myself. Really liked Tamarindo and Ollie’s point. Incredible surfing! Funny that Ollie’s point is nicknamed for Ollie North. Anyway my girlfriend made a list of the best places we went. We were all over. Cool blog. Thanks. Noticia importante para todos los ticos: http://www.diarioextra.com/2008/mayo/05/nacionales08.php POR NO ACEPTAR TRÁFICO DE INFLUENCIAS LE CORTARON LA CABEZA A BERROCAL: Así de contundente fueron las declaraciones del ex director de la Fuerza Pública, Fabio Pizarro, quien visitó DIARIO EXTRA para exponer lo que considera ha sido un montaje político para dañar la imagen del ex ministro Berrocal y la suya, solo por no aceptar el tráfico de influencias. I’m suprised while in Jaco you didn’t take up the opportunity to ride the canopy tour through the jungle. A really fun trip (it has 12 different cables) with really awesome views of Jaco beach. There are plenty of canopy tours around Costa Rica, and I wanted to get out of Jaco – way too crowded for my taste. But thanks for the suggestion! 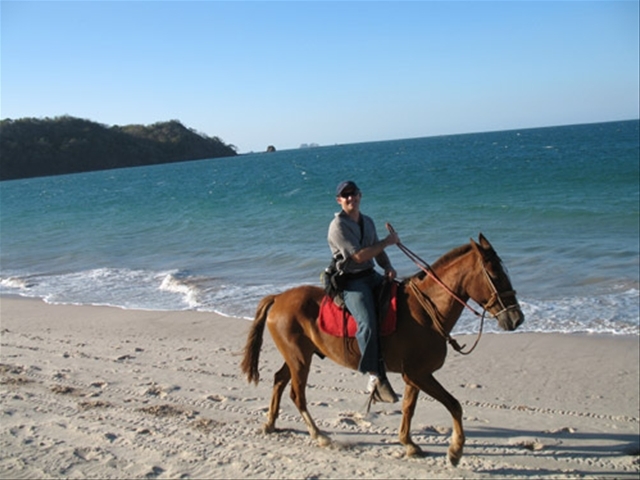 I´m Costa Rican, and working some months in Tamarindo..
Great information Robert. This is great information for a first time vacationer coming to Costa Rica. Those are all my favorite places to visit especially Monteverde!! This will definitely help people looking to come to Costa Rica…my next vacation is to Lookout Inn (so cute)! Robert – great info. I am about to go to Costa Rica with my 7 and 9 year old. Do you think the Tiki Huts are too adventurous for them? What kind of critters visit you in the room at night? Eric, I think 7 & 9 year old boys are about as resilient as they come. But there are snakes and insects of all kinds. I actually got bit by a scorpion while there. Felt like a wasp bite.